I use pouches for my nano at the gym because they are easy to wash, and they don't get in my way like an armband does when I'm working with resistance machines or free weights. I used a size 8 hook, but worked a bit loose, a size 7 may be better. Check gauge after first 5 rounds. It should be 1 7/8 inches across the bottom and 3/4 inch long. I used a chain then slipstitched that for the foundation chain because I like the way it looks and holds up better that way. 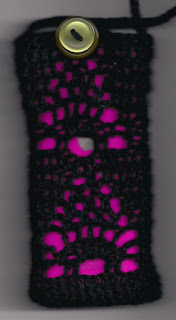 I turn the chain on it's side and work the front and back through two loops like you do with just flat crochet. The reinforcement seems to help all my bags not stretch and get that lacy look at the bottom. 5/8 inch button- I actually stacked one button on top of another button because I liked the way it looked. Tapestry needle that the cotton will fit through. Chain (ch) 16, slip stitch (sl st) into second chain from hook and sl st down length. Foundation chain made. Round 5: Ch 3, double crochet (dc) in next st, ch 2, skip 2 sts, dc in next 2 sts, ch 3, skip 3 sts, dc in next 2 sts, ch 2, dc in next 4 sts, ch 2, skip 2 sts, dc in next 2 sts, ch 3, skip 3 sts, dc in next 2 sts, ch 2, dc in next 2 sts, sl st to join. Round 6: Ch 3, dc in next st, ch 2, sc in ch 2 space, 5 dc in ch 3 space, sc in ch 2 space, ch 2, dc in next 4 sts, ch 2, sc in ch 2 space, 5 dc in ch 3 space, sc in ch 2 space, ch 2, dc in next 2 sts, sl st to join. Round 7: Ch 3, dc in next st, ch 2, *dc in next dc, ch 1,* repeat ** 3 times, dc in next dc, ch 2, dc in next 4 dc,st, ch 2, *dc in next dc, ch 1,* repeat ** 3 times, dc in next dc, ch 2, dc in next 2 dc, sl st to join. Round 8: Ch 3, dc in next st, dc in ch 2 space, ch 2, sc in ch 1 space, ch 3, sc in ch 1 space, ch 3, sc in ch 1 space,ch 3, sc in ch 1 space, ch 2, dc in ch 2 space, dc in next 4 dc, dc in ch 2 space, ch 2, sc in ch 1 space, ch 3, sc in ch 1 space, ch 3, sc in ch 1 space,ch 3, sc in ch 1 space, ch 2, dc in ch 2 space, dc in next 2 dc, sl st to join. Round 9: Ch 3, dc in next 2 dc, dc in ch 2 space, ch 2, sc in first loop, ch 3, sc in next loop, ch 3, sc in next loop, ch 2, dc in ch 2 space, dc in next 6 sts, dc in next 2 dc, dc in ch 2 space, ch 2, sc in first loop, ch 3, sc in next loop, ch 3, sc in next loop, ch 2, dc in ch 2 space, dc in next 3 sts, sl st to join. Round 11: ch 3, dc in next 4 dc, dc in ch 2 space, ch 1, sc in loop, ch 1, dc in ch 2 space, dc in next 10 dc, dc in ch 2 space, ch 1, sc in loop, ch 1, dc in ch 2 space, dc in next 5 dc, sl st to join. Round 13: Ch 3, dc in next st, ch 2, skip 2 sts, dc in next 2 sts, ch 3, skip 3 sts, dc in next 2 sts, ch 2, dc in next 4 sts, ch 2, skip 2 sts, dc in next 2 sts, ch 3, skip 3 sts, dc in next 2 sts, ch 2, dc in next 2 sts, sl st to join. Round 14:Ch 3, dc in next st, ch 2, sc in ch 2 space, 5 dc in ch 3 space, sc in ch 2 space, ch 2, dc in next 4 sts, ch 2, sc in ch 2 space, 5 dc in ch 3 space, sc in ch 2 space, ch 2, dc in next 2 sts, sl st to join. Round 15:Ch 3, dc in next st, ch 2, *dc in next dc, ch 1,* repeat ** 3 times, dc in next dc, ch 2, dc in next 4 dc,st, ch 2, *dc in next dc, ch 1,* repeat ** 3 times, dc in next dc, ch 2, dc in next 2 dc, sl st to join. Round 16:Ch 3, dc in next st, dc in ch 2 space, ch 2, sc in ch 1 space, ch 3, sc in ch 1 space, ch 3, sc in ch 1 space,ch 3, sc in ch 1 space, ch 2, dc in ch 2 space, dc in next 4 dc, dc in ch 2 space, ch 2, sc in ch 1 space, ch 3, sc in ch 1 space, ch 3, sc in ch 1 space,ch 3, sc in ch 1 space, ch 2, dc in ch 2 space, dc in next 2 dc, sl st to join. Round 17: Ch 3, dc in next 2 dc, dc in ch 2 space, ch 2, sc in first loop, ch 3, sc in next loop, ch 3, sc in next loop, ch 2, dc in ch 2 space, dc in next 6 sts, dc in next 2 dc, dc in ch 2 space, ch 2, sc in first loop, ch 3, sc in next loop, ch 3, sc in next loop, ch 2, dc in ch 2 space, dc in next 3 sts, sl st to join. Round 19:ch 3, dc in next 4 dc, dc in ch 2 space, ch 1, sc in loop, ch 1, dc in ch 2 space, dc in next 10 dc, dc in ch 2 space, ch 1, sc in loop, ch 1, dc in ch 2 space, dc in next 5 dc, sl st to join. Round 20: ch 1 (does not count as first sc), sc in first 7 sts, chain 10, skip next st, sc the rest of the way around. Sl st to join. Ch 10 works as button loop. Strap: Chain 180, count 7 sts from opposite side of button loop, sl st in that st, sl st back up ch and sl st to join at the start point. Break off thread. Sew on button on the top of the other side opposite button loop.